one of the largest Fireplace Showrooms in the UK. great fun with a ride on tractors. Don't miss out! MEGA DEAL £200 OFF NOW! 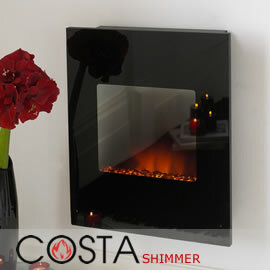 New range of Costa Electric Fires now available including the Costa Shimmer hang on the wall electric fire (Shown Above) for only £199!! 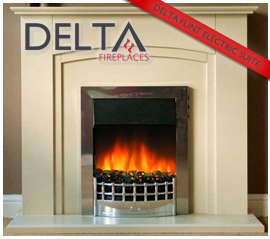 Fantastic range of electric fireplace suites from Delta Fireplaces including the Delta Flint Electric Fireplace Suite (Shown Above). Know what Heat output you need? Click here to use our Wattage Calculator, and find out what you need for your own home. We offer the largest range of gas fires, electric fires and the best fireplaces including wooden surrounds and electric fireplaces. We also specialise in gas stoves, electric stoves, wood stoves and multifuel stoves in traditional, contemporary and modern designs from all of the UK's top fireplace brands and fire brands. We are also specialists in hole in wall fireplaces. 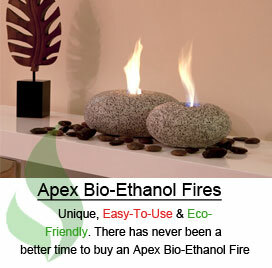 Fires galore at Fireplace Megastore - the fireplace store online! We have a fantastic selection of electric fires to choose from including plug and heat radiator electric fires from big names like Orial, to wall mounted electric fires with a contemporary look and amazing flame effects, sound effects and mood lighting. Plus you always get a great deal on electric fires at Fireplace Megastore. Our aim is to provide high quality gas fires, electric fires, fireplaces and stoves at the lowest prices with honest impartial professional advice from start to finish, with the simplicity and convenience of shopping securely online 24 hours a day. We're pleased to announce that we are so confident on our products that selected Apex Gas fires now come with an incredible 3 Year Warranty. We are proud to be suppliers of fires and fireplaces to ITV's 60 Minute Makeover programme. We are proud to be suppliers of fires and fireplaces to BBC's DIY SOS programme. We always guarantee a hotprice as you would expect from the leading fireplacestoreonline. As we offer a vast range of gas fires, electric fires, modern fireplaces, traditional fireplaces and contemporary fireplaces. You can also buy online 24 hours a day 365 days a year and we deliver throughout the UK to places like Wrexham, Cheshire, Wirral, Liverpool, Manchester, Birmingham, Glasgow, Edinburgh, London, Cardiff, Newcastle. to ensure we continue to provide the lowest prices on all our products. the UK for the same product every time! With over 30 years experience in the supply of all types of fires & fireplaces our fully trained sales team are on hand to offer all the advice you will need to ensure your choice is the right one for you and your home.